The scene in the film Gasland, where landowner Mike Markham ignites gas mixed with water from a running water tap in his home mobilized more people than any report on fracking. This new drilling technique to extract natural gas is using explosives and 596 types of chemicals, including known carcinogens. But when the governments of Quebec, France and Bulgaria decided to halt the spread of fracking to their constituencies, it was not because they or 1000s of people were moved by a documentary. It was because the anger and fast growing demonstrations in these countries came on top of the good arguments to leave that type of unconventional gas under the grass. EJOLT has documented the struggles against fracking in Quebec, Europe and South Africa in our most recent report (chapter 3: Leave the gas under the grass: p 90-111). Fracking has caused the biggest and fastest mobilizations on any environmental issue in many regions. But let’s put the environmental concern or social unrest aside for a moment and just look at the economics of shale gas in Europe. Using figures from key industry sources and economic experts, this factsheet from Friends of the Earth Europe concludes that shale gas could at best only represent 2-3% of the European gas demand in 2030. According to their calculations, the extraction would only be viable if supported by massive subsidies from European governments. Even the gas industry reckons that gas prices would need to double before shale-gas exploration in Europe becomes profitable. Now, putting the bad economics aside again, the technology has already contaminated water supplies, harmed people’s health, created smaller earthquake’s, polluted the air in large regions and is constantly contributing to dangerous climate change – as this report sums up. Speaking of climate change and the EU, here is one of the starkest contradictions in the whole story. Today, Europe’s energy and climate policies are mutually exclusive. While DG Energy wants to open Europe for a new source of fossil fuels, DG Clima is working to prevent 2°C or more of global warming. In 2009, the EU has committed itself to this goal in Copenhagen. Scientists now know that in order to stand a reasonable chance of keeping below 2°C, around 80% of all known fossil fuel reserves need to stay in the ground as burning them would cause too much global warming. Even The Economist recognizes that we are faced with huge amounts of unburnable fuels. Policymakers in the EU, who read The Economist, know that this liberal magazine is not some environmental activist group crying wolf on the coming apocalypse without checking their sources. But instead of debating which reserves will be kept under the ground and how, the recent EU Energy Summit concluded with the message that Europe needs a shale-gas revolution. If that plan goes ahead, something is deeply rotten in the way policy is made in the EU. The simple truth is that the EU needs to choose which policy it wants: more or less fossil fuels? You can’t have both. The good news is: keeping fossil fuels in the ground is no longer a far fetched idea that can’t work in practice. 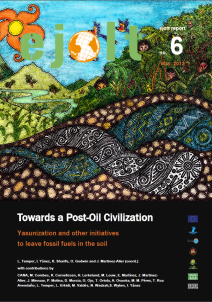 Tools already exist, such as the Yasuni-ITT initiative. It is a matter of political courage. We’ve put these facts and policy options in a workable 4-page policy briefing for EU leaders. We know the inconvenient truth and we now the solutions aren’t easy, but we have a choice.